Some picture books have wonderful rich stories that catapult you into a different world and take you on a grand adventure. Other picture books are quieter, more contemplative, in nature. Today's picture book review title is just such a book. The story is a very simple one, and yet it is still meaningful and incredibly enriching. 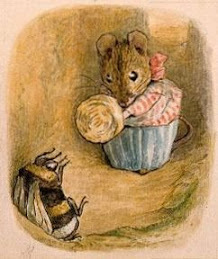 It is spring and a little mouse, who lives in a burrow in the middle of a meadow under a clump of dandelions, pops his head out of his hole and takes in the world around him. He explores, watching a snail and bees go about their business. He listens to the sound of a woodpecker hammering away at a tree. Next the little mouse looks at his reflection in a puddle and then he heads off home, a little seed in his mouth. He goes down a tunnel into his kitchen, down another tunnel to his bedroom, and then down yet another tunnel to his storeroom, where the shelves are mostly bare. On a summer morning the little mouse “pops out of his hole” and heads out to check on his neighbors. He watches the beavers, who are busy working on their lodge in the pond, and then pops in to visit a toad who has set up house under an upside down flower pot. At the end of the day the mouse carries a sprig of watercress home and he puts it in his store room, which is starting to fill up. When fall comes around, leaves lie on the ground and the mouse has a grand time tunneling through them. Everywhere he turns he sees and hears signs that winter is coming. Animals are on the move and there is a lot of work to be done. At the end of the day the mouse carries a big acorn back to his storeroom. In this delightful and gently sweet picture book we go through the seasons with an industrious little mouse, whose days are full of visits, explorations, and food collecting work. Throughout the book beautiful illustrations capture little mouse’s world to perfection. The pictures take us into his world, even down into his cunning little home, and we cannot help growing fond of our new little friend. We watch the seasons unfold in gorgeous color, and can appreciate how much joy is to be had from life’s little pleasures.